Mission: America's Hatefrau Linda Harvey: Katy Perry, Lenny Kravitz and Her Sharks Twerk for Satan! Home/Featured/Mission: America’s Hatefrau Linda Harvey: Katy Perry, Lenny Kravitz and Her Sharks Twerk for Satan! “The halftime performance of Katy Perry at the 2015 Super Bowl seemed to be all about choice. While the show was a spectacle on a grand scale, the content was shady. Perry held out foolish choices with eternal consequences on an altar of defiance. Sexual confusion is a natural companion to spiritual apostasy. Perry proceeded to bend over in some suggestive twerking with Lenny Kravitz and then sang another hit, telling us that she ‘kissed a girl and liked it.’ The lyrics go on to say, ‘I hope my boyfriend don’t mind it.’ This 2008 song is a prime expose of the lies embedded in the homosexual agenda. Not that Perry leads that effort. Just like her flirtation with Satan, she’s merely joining and providing theme music for a movement that long pre-dates her. There would be a predictable reaction if a well-known homosexual man crooned that he had ‘kissed a boy and liked it’ and he ‘hopes his boyfriend don’t mind it.’ If such a song even saw the light of day, it would be instantly labeled bigotry, hate and right-wing extremism. After all, one is never allowed to experiment in that direction. Satan and his mouthpieces will make sure such a notion never gains traction.” – Dented Columbus, OH hatefrau Linda Harvey, writing for Matt Barber’s Barbwire. We have to presume Harvey meant “kissed a girl” in that last bit. Well that’s that. I have found my epitaph. 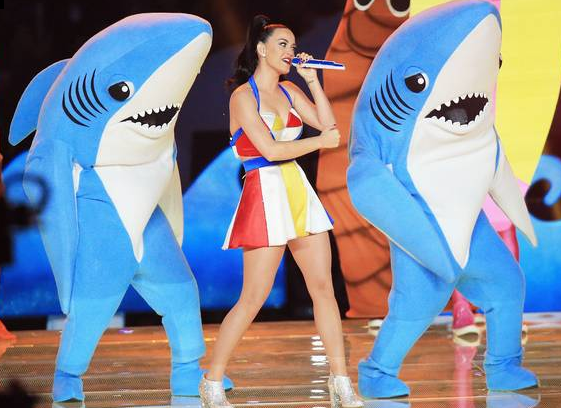 Katy Perry might actually be the Devil since she has demanded a website remove a design for a 3D printed model of a Left Shark costume, after a dancer wearing a shark suit went viral for seemingly forgetting their routine during a Super Bowl half-time performance. Perry with the help of lawyers went after Fernando Sosa who began selling a design for the costume via an online directory of blueprints. Sosa posted a copy of the letter he received on Instagram, which read: “As you are undoubtedly aware, our client never consented to your use of its copyrighted work and IP, nor did our client consent to the sale of the infringing product. In the item’s description, he wrote: “Since some lawyers send [sic] a cease and desist to Shapeways.com where I was selling this little bad boy shark and [sic] I cannot longer sell this. These loons are SO entertaining, though it’s important to remember that they’re sometimes very dangerous. My GODS! I’m baffled by her thing about a gay singer saying he kissed a guy and hopes his b.f. doesn’t mind? What’s her point? Poeple cheat all the time… straight people too… or am I missing something? What the F****????? ?